As a relatively isolated bushland ribbon in a well-developed urban area, the Wolli Creek Valley is an attractive haven for birds. It provides food, shelter, a passageway and resting place for migratory species and a niche in its own right for resident birds. The valley provides a major west-east corridor for migrants moving between the high country west of Sydney and the coast and it serves as a significant stepping-stone across Sydney’s urban south for migrants moving north-south. Over 100 bird species that have been seen here which is a testament to the valley’s diversity and strategic location. 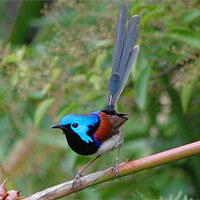 The most common small birds you might see are Superb Fairy Wrens, New Holland Honeyeaters and Silvereyes. A good place to spot wrens and also Red Browed Finches is at the Paperbark Creek crossing near the Bray Ave wetland, where they come to bathe. Common larger birds include Red Wattlebirds and Rainbow Lorikeets, wherever there are flowering gums or Illawarra Flame trees in summer. If you go down by the weir in Turrella Reserve, you will see many water birds. These include the Dusky Moorhen, various ducks and cormorants and maybe a Great Egret or White Faced Heron. If you’re really lucky you might see the Nankeen Night Herons or Quails that have been sighted breeding there. A quiet barbecue in Girrahween Park is likely to be visited by the Grey Butcherbirds that live there, and you might see Rosellas or even a King Parrot in the surrounding trees. If the ubiquitous Noisy Miners are getting agitated, the resident Brown Goshawk may be on the move. In summer, you can hear the racket created by cuckoos or a flock of Sulphur Crested or Yellow Tailed Black cockatoos flying over. The Spotted Pardalotes and Eastern Whip Birds are more likely to be heard than seen. We also have a resident pair of Kookaburras, whose laugh can often be heard as they call out to mark their territory. We have a survey sheet that is used for our regular monthly surveys. We’d love to hear of any sightings not on the sheet and receive good photos of anything you see. Contact wolli_birds@wollicreek.org.au. Also email us at that address if you would like to join one of the WCPS’s bird_surveys. 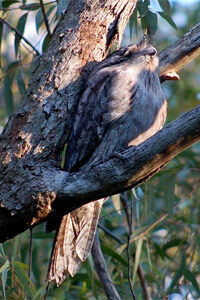 Wolli Creek Valley has a few visiting owls and possibly a resident pair of Tawny Frogmouths. 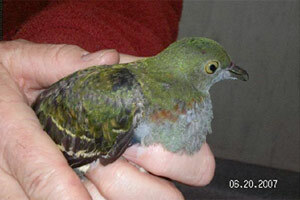 A night fauna survey was conducted by DECC in 2007. Owl calls were played out into the Valley but on that occasion, no replies were heard. Since then however, a number of species have been observed in the Valley. The Tawny Frogmouths (not technically an owl) were the first. Tawny Frogmouths are an owl-like night bird and were rediscovered in the Wolli Valley in August 2007, after an absence of at least 38 years. A pair of the cryptic pigeon-sized birds took up residence in Girrahween Park where they were spotted by sharp-eyed Voren O’Brien of the Wolli Creek Preservation Society. “These birds are Australian icons, imitating broken grey branches to remain unseen. Seeing them in the Wolli Valley so close to Sydney’s centre is a special thrill”, Voren said. Records of bird species seen in the valley since 1940 are available in Birds of Wolli Valley, published by the Preservation Society. Based on the meticulous records of Neil Rankin between 1970 and 2001, the book shows a single sighting of a frogmouth between 1940 and 1969 and none since. So, it is great to see them around again. Tawny frogmouths are relatively common in bushland around Sydney but have probably only recolonised the Wolli Valley very recently. The birds are active at night, hunting small animals such as mice, frogs and insects. By day they roost on branches close to a tree trunk where their bark-coloured plumage makes them almost invisible to an untrained observer. On 11 April 2008 a school group paused near Wave Rock and discovered a Southern Boobook owl right in front of them! After excited whisperings, pointings and a few discreet photos the group moved away to discuss the importance of the find. 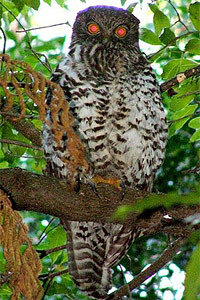 Even more significant was the sighting by Gavin Gatenby on 29 May 2008 of a Powerful Owl near in Girrahween Park. It was thought this species might turn up. A camp of Grey-headed flying-foxes had arrived in Wolli and been growing in numbers since June 2007. The Powerful Owl is one of the bats’ few natural predators. 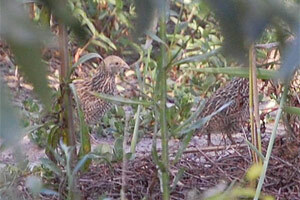 In January 2010, three adult quail were sighted at the dipping pond in Turrella Reserve. They may have been coming out of the pond after drinking when Gavin arrived at the dirt mound. Two of then took to the air and flew a few metres into the dense new planting. He watched for a while and then a third emerged from cover below the stump of the coral tree and scampered off into the thicket. At the end of January 2010, a juvenile Nankeen night heron was spotted at the oak tree on Wolli Creek. A little later Gavin took a closer look and saw than an adult was with it. They lay 2 to 5 eggs. Maybe each adult takes one chick with it. Damon Basset, his family and the Girrahween bird watching group saw a pair (male and female) at the Girahween end of the central track after the creek crossing in the dense veg in October 2009. A sighting was also earlier recorded in October 2008. Before then, the only other Wolli record was a single sighting on Turrella Reserve in 1994, so this is a rare event! One of the quick-thinking Girahween members got some photos. In January 2010, Chris Bartlett reported seeing two King Parrots in a poplar in Banks Road. 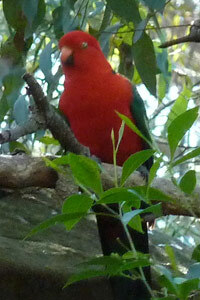 The King Parrots were seen again in March 2010 & recorded. A pair were also seen at Girrahween late in August 2010. So, its looks like they may be making a comeback to the area. 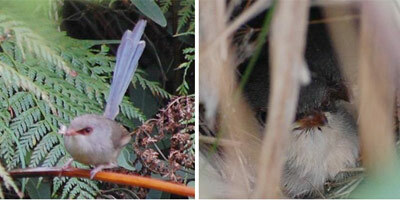 On the evening of 5 August 2007, Gavin Gatenby spotted what he thought was a male Variegated Fairy Wren and his troop in thick scrub near the escarpments on the Girrahween track. He reports “Luckily I had my camera with me and, braving the low-light conditions, I took a quick shot, resulting in a lousy image, but good enough to confirm the first ever sighting of the species in the Wolli Valley”. A chance conversation in Turrella Reserve with photographer Alexander Choi unearthed photos he’d taken of this species and excitement reached an all time high when Voren O’Brien discovered two adult males, a female and a nest of young Variegated Fairy Wrens on her nature rounds before the WCPS Committee Xmas dinner in 2007. To an inexperienced observer the Variegated Fairy Wren (Malurus lamberti) might understandably be mistaken for the well-known “Blue Wren” (officially known as Superb Blue Wren). But it’s difficult to see how its presence could have escaped the notice of such an experienced birdwatcher as the late Neil Rankin who meticulously recorded the valley’s birdlife until his death in 2001. These are not the sort of birds that can suddenly migrate into the area from many kilometers away, so we can only conclude that a small remnant population has been present, all along, in the nearby Bardwell Valley, from which they have now re-colonized Wolli. Here the female carries food to her young. The nestlings are concealed in a domed, grass nest with a side entrance very close to the ground. A sad postscript to this story is the discovery the very next day, that the nest was empty apart from some large black ants. It’s impossible to say what predator is to blame. Snakes are major nest predators of Fairy Wrens and large birds such as Currawongs will take eggs or nestlings of smaller birds. And perhaps it is no coincidence that only two weeks earlier a fox was spotted mere meters from this very nest. But the species seems to be fairly resilient. A family group was spotted on the Girrahween Track near Cormorants Corner and while the female would not reuse her original nest, she hopefully built elsewhere and attempted a second brood. In July 2008 a male Variegated Wren was observed in Jackson’s Quarry. This bird has only been recorded in the Sydney region about 20 times since 1953 and only once before that – in 1876! In June 2007, an injured first-year male Purple-crowned (Superb) Fruit-dove was found by Peter Stevens on the Undercliffe Track. “This is a real rarity this far south,” an excited Peter said. Alan Leishman of the Society advises that, “This bird would be considered to be an uncommon one in the Sydney region and the current specimen probably on migration”. It has never been reported before in the Wolli Valley. Although these Fruit-doves possibly occur more often than the records indicate, as they are difficult birds to see while quietly feeding among the outer foliage of berry-bearing trees, often high up. On the advice of WIRES, the volunteer wildlife rescue group, the bird was taken to local vet Peter Nicholl of the Earlwood Animal Hospital. It was then nursed back to health by Chis Lloyd, WIRES carer and bird specialist. Its tail feathers slowly grew back and it was eventually released near where it was found.